I visit The Arboretum at Penn State on my daily walks at lunchtime or after work. It’s one of my favorite places on a campus that is full of scenic and peaceful spots. Over the past few years I have been taking photos of various spots at weekly intervals. Below are some of my images through the four seasons. Enjoy this slide show of images from Penn State and State College, PA.
Join me and over 20 other authors at BookFest PA on Saturday, July 16 from 10 – 5 outside of Schlow Library in State College. We will be signing and selling books, as well as chatting with readers. Many people know about The Central Pennsylvania Festival of the Arts, better known as Arts Fest. It’s a five-day event, featuring artists from all over the country, selling their work along the sidewalks of State College and Penn State’s University Park Campus. Arts Fest is an event State College residents look forward to all year long. The festival includes fun for kids, live music, 5K and 10K runs, numerous other events, and a variety of food vendors. It draws about 125,000 people annually and is a boon for local business during State College’s quiet summer months. For the second year in a row, Arts Fest includes BookFest PA. Featured authors Lisa Scottoline, Tamar Myers, and Nancy Martin, will be there along with Cyn Balog, Josh Berk, Lyndsay Eland, Lyndsay Barrett George, Paul Yeager, and Daryl Gregory. Local authors include Sylvia Apple, Georgia Ann Butler, John F. Carr, Judy Ann Davis, Jeffrey Frazier, John Gastil, Cindy Simmons, Jennifer Herbstritt, Sandra Hill, Ken Hull, Marie Jackman, Heather Jordan, Janice McElhoe, Jodi Moore, Kieryn Nicolas, David Penek, Melicent Sammis, Judith Vicary Swisher, John Swisher, Patricia Thomas, poet Zoë Brigley Thompson, Phillip Winsor, Veronica Winters, and me. Please stop by, say hello, and have your books signed by the authors. Thanks to Pat Griffith at Schlow Library and the other BookFest PA and Arts Fest organizers for making this event happen. Learn more at BookFest PA and at Arts Fest. 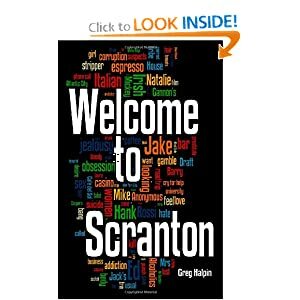 Greg Halpin is the author of Welcome to Scranton.